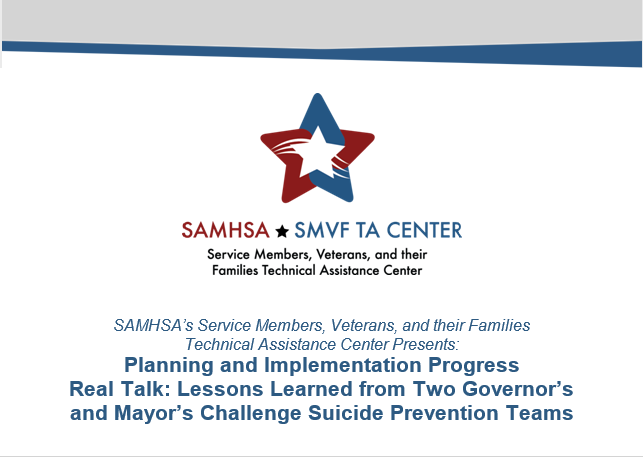 SAMHSA’s Service Members, Veterans, and their Families (SMVF) TA Center will host a webinar in partnership with the Veterans Health Administration (VHA) that will feature two teams participating in the Governor’s and Mayor’s Challenges to Prevent Suicide Among SMVF: Arizona and Richmond, Virginia. This webinar is designed to be both interactive and informative and will address the challenges and opportunities that are inherent in implementing a comprehensive approach to suicide prevention for SMVF. Describe how city-level Mayor’s Challenge efforts inform statewide action plan development and bring best practices to other areas of a state.